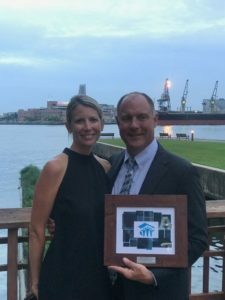 Habitat for Humanity of the Chesapeake is dedicated to eliminating substandard housing locally and worldwide through constructing, rehabilitating and preserving homes; by advocating for fair and just housing policies; and by providing training and access to resources to help families improve their shelter conditions. Habitat for Humanity was founded on the conviction that every man, woman and child should have a simple, durable place to live in dignity and safety, and that decent shelter in decent communities should be a matter of conscience and action for all. Thompson Creek Window Company teamed up with Habitat for Humanity of the Chesapeake for their Company Team Build on Saturday, December 5th in Baltimore City. Habitat for Humanity of the Chesapeake is dedicated to eliminating substandard housing locally and worldwide through constructing, rehabilitating and preserving homes; by advocating for fair and just housing policies; and by providing training and access to resources to help families improve their shelter conditions. Our Team Build volunteers included a variety of Sales, Marketing, Finance and Purchasing employees. Thanks to our wonderful volunteers for taking time out of their Saturday to help rebuild homes by installing brand new trim and window sills. The Team Build provided us with a unique volunteer experience outside of our normal environment, while enhancing our personal interaction skills to work together as a team to contribute to a neighborhood’s revitalization. Participating in a TEAM BUILD provides us with a unique volunteer experience outside of our normal environment, enhance personal interaction skills to work together as a team and contribute to a neighborhood’s revitalization. We all worked together towards Habitat’s mission to bring people together to build homes, communities and hope. To learn more about our Habitat for Humanity partnership, watch this video. Thompson Creek Window Company is currently involved with the Ronald McDonald House Charities in Falls Church, VA, Washington, DC and Baltimore, MD. The mission of Ronald McDonald House Charities (RMHC) is to create, find and support programs that directly improve the health and wellbeing of children. RMHC focuses on the critical needs of children, providing a place to rest and refresh during their hospital care and any other support for families 24 hours a day, 7 days a week. We are providing a room for families for an entire year, covering the fees it costs to run the House operations. We will be volunteering and preparing meals for families to provide them with a sense of relief and relaxation in a family atmosphere within all three Houses. Preparing breakfasts and dinners are an amazing way to connect with families and make a difference in the family’s life. We will also be collecting pop tabs to be recycled and in support of RMHC programs that help children heal faster, cope better and stay healthy. To learn more about our Ronald McDonald partnership, watch this video. Thompson Creek Window Company is proud to partner with Homes for Our Troops by donating energy efficient, easy to clean windows and gutter systems in specially adapted homes being built for severely injured Veterans. Homes for Our Troops (HFOT) is a privately funded 501(c) (3) nonprofit organization building specially adapted, mortgage-free homes nationwide for the most severely injured Veterans from Iraq and Afghanistan. Most of these Veterans have sustained injuries including multiple limb amputations, partial or full paralysis, and/or severe traumatic brain injury (TBI). These homes restore some of the freedom and independence our Veterans sacrificed while defending our country, and enable them to focus on their family, recovery, and rebuilding their lives. Since its inception in 2004, nearly 90 cents of every dollar donated to Homes for Our Troops has gone directly to our program services for Veterans. HFOT builds these homes where the Veteran chooses to live, and continues its relationship with the Veterans after home delivery to assist them with rebuilding their lives. We had the privilege of donating and installing windows and gutters for Army SGT Steven Curry in Nokesville, VA and Marine SGT Marcus Dandrea of Haymarket, VA. Their new homes feature wheelchair accessible doorways and showers, safe rooms and other specially adapted features that will alleviate their worries from their injuries while serving our country. Thompson Creek is proud to partner with Homes for Our Troops, a privately funded nonprofit organization that builds specially-adapted, mortgage-free homes nationwide for the most severely injured veterans from Iraq and Afghanistan. Most of these veterans have sustained combat injuries including multiple limb amputations, partial or full paralysis, and/or severe traumatic brain injury (TBI). Homes for our Troops build homes as a departure point for these veterans to rebuild their lives, and once again become highly productive members of society. Thompson Creek Window Company will be volunteering, donating, and installing windows this upcoming spring on the brand new homes for Army Sergeant Steven Curry in Nokesville, VA, and Corporal Marcus Dandrea in Haymarket, VA, both hurt while in active duty in our United States Military. To learn more about our Homes for Our Troops partnership, watch this video. Every year, Thompson Creek Window Company holds their annual Going Pink for Breast Cancer Fundraiser in October. Throughout the month they raised money through pink wristband sales, personal donations and pink Thompson Creek branded shirts for each employee to wear both in the office and in customer facing positions to show support for this great cause. Every dollar raised was donated directly to Anne Arundel Medical Center Foundation to support patients, families and research. “We chose the AAMC Breast Center because we felt it was important to support our local community. It is important to us that all women have access to care and treatment and we were particularly pleased to learn that AAMC provides financial assistance to those who are struggling to make ends meet while undergoing treatment” said Rick Wuest, President, Thompson Creek Window Company. Thompson Creek Window Company was featured on ABC2/WMAR-TV Baltimore’s Built Upon a Dream Project! Every year, WMAR-TV works with an organization in dire need in the local community and they picked The Children’s Home in Catonsville, MD! The Children’s Home provides care in a safe, home-like living environment and its campus provides a suburban setting where children can feel secure, nurtured and have a sense of belonging. The Home serves children from throughout the state of Maryland who are victims of abuse, neglect and are in need of supervised care. The Home was established in 1863 as a facility for the children of German descent orphaned by the Civil War. Thompson Creek Window Company is proud to be a drop off and collection site for the U.S. Marine Corps Reserve Toys for Tots Program again this holiday season! Throughout December, we collect new, unwrapped toys and cash donations for less fortunate children in our local community in Prince George’s County.